Tricia is a native resident of Northern New Mexico and was born in Santa Fe. She is a Certified Financial Planner with over 15 years of experience in Wealth Management including Investment Management, Financial Planning and Trust Administration. 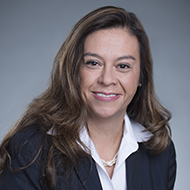 Tricia previously worked with First National Bank of Santa Fe from 2008-2013 and managed the Investment Services / LPL Financial division. As a trusted advisor, I am in the relationship for long term. There are no short term gains or transactions. I want to be involved in financial planning / decisions as part of the team that helps you reach your long term goals. I love the moment when I am meeting with a new client and the meeting transitions from prospect to lifelong client. Once the trust is established the client is much more engaged in the conversation, the planning process and implementing the suggestions we are recommending.